1D Stock Cutter (1DSC) is the length cutting optimizer - fast, powerful, compact and easy to use software tool for cutting to length of any linear (one-dimensional) material: profiles, bars, extrusions, pipes, tubes, channels, angles, rods, lineal wood boards, beams, lumber, and so on. 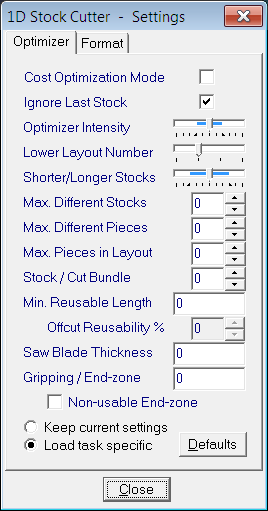 - easy installation / uninstallation; Linear material cutting optimization (length nesting) software solves the so-called One-dimensional Stock Cutting / Bin Packing Problem: optimizes the distribution of a large number of pieces (parts) having mostly different lengths amongst a number of uniform or different stock lengths/sizes. 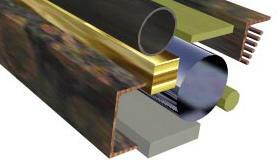 The main goal is to minimize either the overall material waste, or the associated material cost. Typically, 1DSC brings down material waste by a factor of 10 (from about 10% to about 1%) with respect to manual cut planning. Program run time is around 1 - 100 seconds depending on the number of items involved and CPU speed. In any case, it saves time and reduces the level of experience required for cut planning dramatically. Working with 1D Stock Cutter is easy. Most of the actual task data are presented at the Task Page - the main program control center that allows a user to create a new task, open a stored task file, enter or modify task initial data, activate optimizer run, check resulting cutting layouts (patterns) and main totals. Never enter the same information twice or any unnecessary information. The program supports data copy / paste from Excel / Access tables, allows easy entry and switching between decimal and fraction formats: any Metric units (like 14.75) or Imperial feet & inches (like 14-3/4" or 1'-2-3/4"). 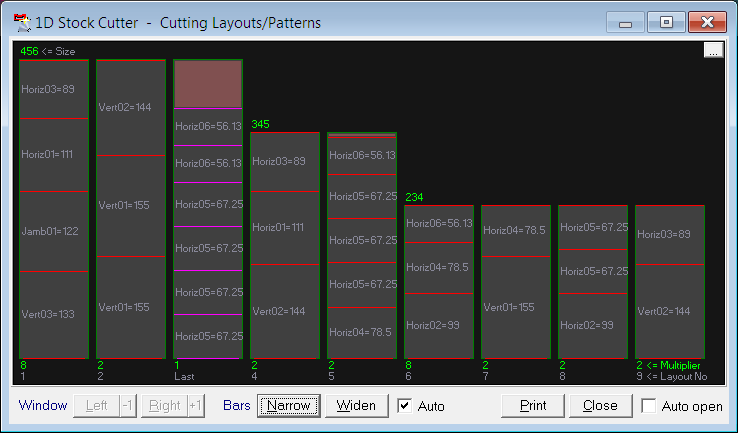 The Image Page presents a visual illustration of the resulting layouts (cutting patterns) in an intuitive and adjustable format. You may arrange both Task and Image pages on the screen, modify task initial data, and repeat solver runs without closing Image page – it will follow the new solutions immediately. 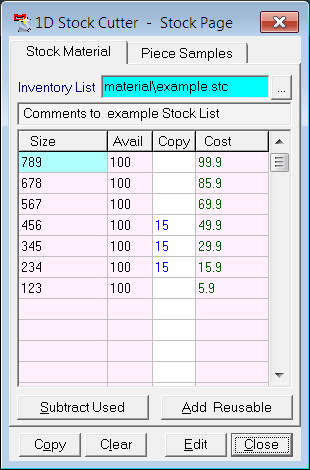 The Stock Page (Stock Material and Piece Samples tabs) allows you to collect, manage and use in conjunction with the actual task your domestic stock inventory lists for any number of stock material types you need, as well as your piece samples (part reference) lists. 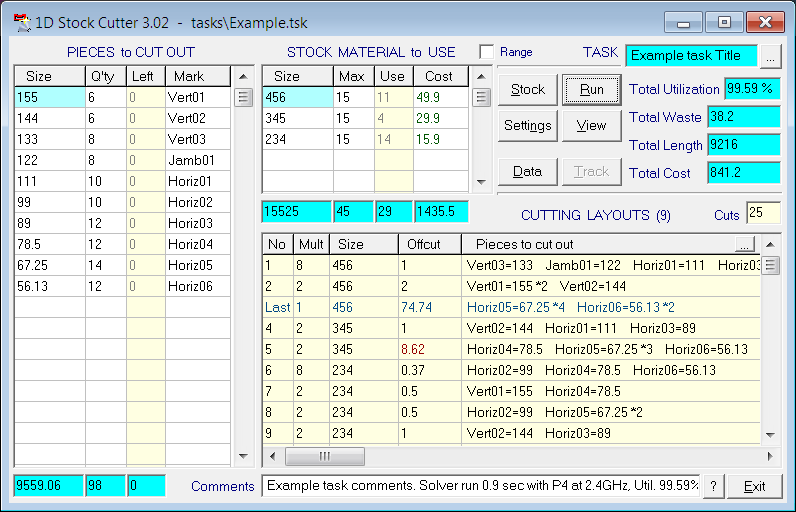 Using this page, you can simply put together certain available stock or ordered piece items and copy them directly into the Task Page tables in order to process in the current task, as well as subtract stock/piece items being used/produced in an accepted solution from the inventory/reference lists and return back the reusable stock remnants (off-cuts). Note that 1D Stock Cutter is intended for optimizing cutting of a large number of pieces having mostly different sizes, as well as groups of identical pieces, and using uniform stock lengths, as well as any variety of different stock lengths. You may either enter actually available stock lengthes and quantities, or specify a range of stock sizes available for purchase to choose the best one from. Optimizer goal, as well as main technology settings, such as minimal reusable length, trim losses, piece gripping end, saw blade thickness - are adjustable. Calculated layout sequence may be also optimized for using of a limited number of stacking bins near cutting machine. The program supports network data sharing and data import and export via common ASCII text or CSV files with adjustable format. 1DSC import files can be created by MS Notepad or the other simple word processor, spreadsheet, database, or 3rd party program. 1D Stock Cutter can run on Windows 95/98/NT/2000/Me/XP/Vista/7/10.. (32/64-bit) on common PCs beginning with 486/DX2-66 with 800*600 or higher resolution monitor. Pentium II or higher and 1024*768 resolution is recommended for comfortable use. 1D Stock Cutter optimizer engine is also available in the form of either dll-procedure, or batch processing executable program. The software can be customized upon request to suit your specific needs, in particular regarding data import and export formats and other capabilities. Press here to download 1D Stock Cutter 30-day Trial or Free version. Press here to download 1DSC Help file (User manual, 70 KB). Press here to download 1DSC "How to" manual from BOISE Engineered Wood Products (*.pdf, 411 KB).